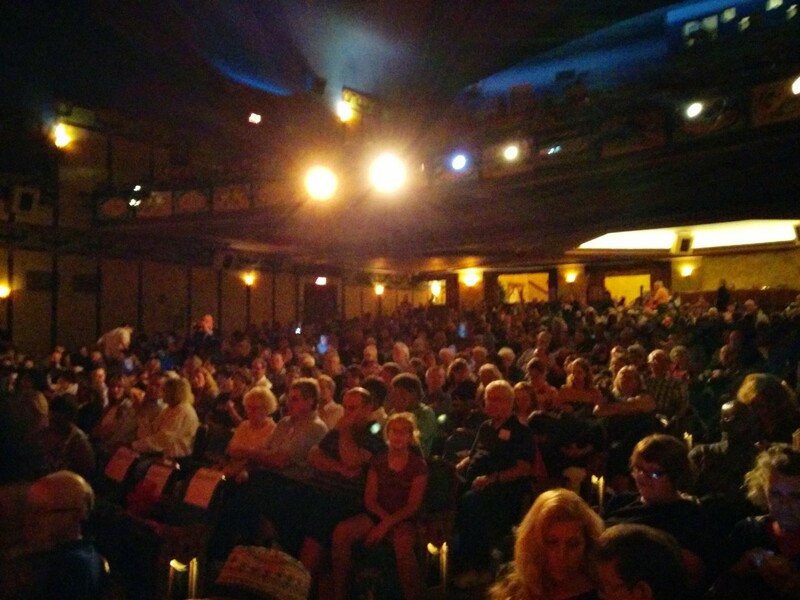 This past weekend, I was pleased to join a large and nearly sold out crowd at the Redford Theatre to welcome acclaimed actress Rita Moreno to Detroit. 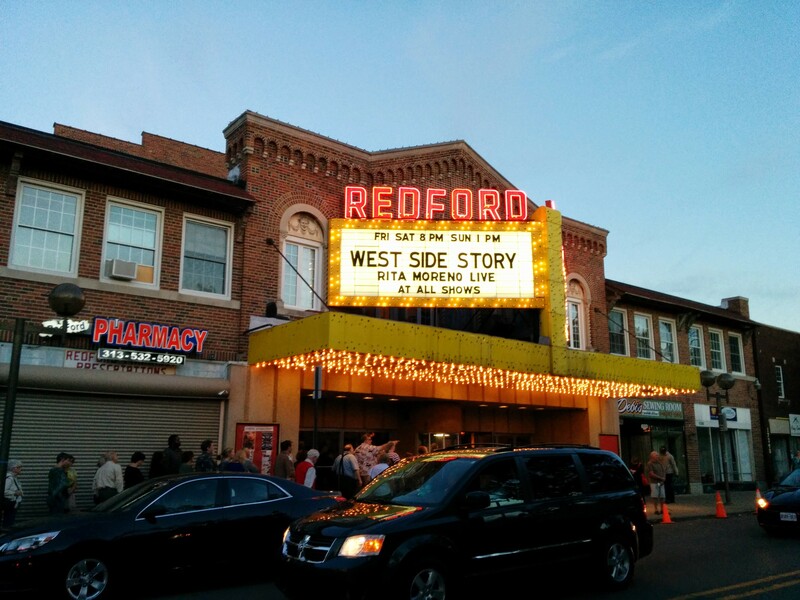 The theatre offered three opportunities to meet Moreno and watch her classic West Side Story on their beautiful screen, and I’m sure that the Saturday night screening I attended was the most popular. I first heard about this event over six months ago at the theatre’s similarly festive winter evening to honor Pam Grier (recapped in a blog post) and didn’t think I would attend. But a few days before the weekend, I thought about it again and figured it was worth it, especially since Moreno is a Bay Area resident who I had not encountered during my time there, though she appears semi – frequently at events related to Berkeley Repertory Theatre. I did not expect her to be so classy and elegant in all aspects of her presence, which was a wonderful surprise. The theatre was packed as I scanned the main level for a place to sit. Surprisingly, there were several seats left in the first couple of rows, and so I snagged a spot in the second row. Once the lights went down and Ms. Moreno appeared alongside a local radio interviewer, I realized I’d gotten the best seat in the house! The two of them stayed in that far stage right area and did not move around the stage, which made for optimum photo taking from my seat just six feet away or so. Moreno offered numerous past and present anecdotes from her career in a warm, honey silk tone of voice. When the two of them returned at the film’s intermission, she playfully used his sweaty state as a way to raise the tension and immediacy as they talked in full view of the audience. The interviewer (wish I’d written down his name, but he’s definitely based in Ann Arbor) guided Moreno through what seemed to be some repetition from the previous night’s topics and some new material. She seemed to particularly appreciate The Electric Company‘s historical place in her career, while also noting later roles such as her work in Oz and multiple series work with Fran Drescher. Regarding West Side Story, Moreno’s stories focused on the understandably grueling process of learning difficult choreography from (the reportedly difficult) choreographer Jerome Robbins, who took no favorites among the cast and crew, and was reportedly not well liked by anyone involved in the production. But at the same time, she noted that his keen visual sense contributed to the film’s precise and enduring visual style. She also noted that her most well – known song, America, featured a style of dancing different than what she was accustomed to at the time. The Redford later played a recap of her amazingly brief 1962 Academy Awards acceptance speech, and Moreno seemed slightly embarrassed to revisit the memory, saying that she had made peace with the moment in her past, but would have honored more of her Puerto Rican and Hispanic compatriots if she could do it again. She noted that her receipt of a SAG lifetime achievement award early this year, presented by her past co-star Morgan Freeman, felt like a more fitting tribute for her and opportunity to pay homage to her entire industry work as opposed to a single performance. 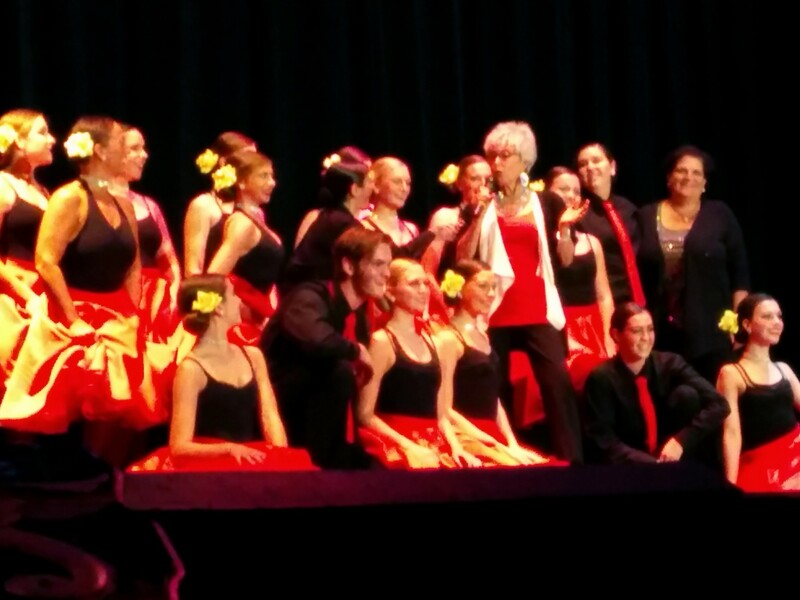 The Redford had a surprise up their sleeves for Ms. Moreno and those of us in the audience. The West Side Story intermission included a special performance by a local dance troupe perfuming new choreography to America, with Moreno watching in the audience from a seat specially engraved with her name. The troupe members appeared to be mid to late high school age, and deftly navigated the stage with style and flair in their movement. I’m sure it was a thrill for them to meet Moreno directly following their performance and get a photo with her, while being witnessed by those of us in the audience. I found it appealing and intense to see a classic in its rightful place on the big screen. Elements of the film, including its choreography and slightly psychedelic 1960s visual moments, seemed to POP more on the big screen. On the other hand, my more mature viewpoint observed various acting choices I most likely did not notice in my early viewings of the film as a pre-teen. And, later, I found myself wondering about the career trajectories of various members of the cast, most notably Natalie Wood, who died in 1981 under mysterious circumstances. 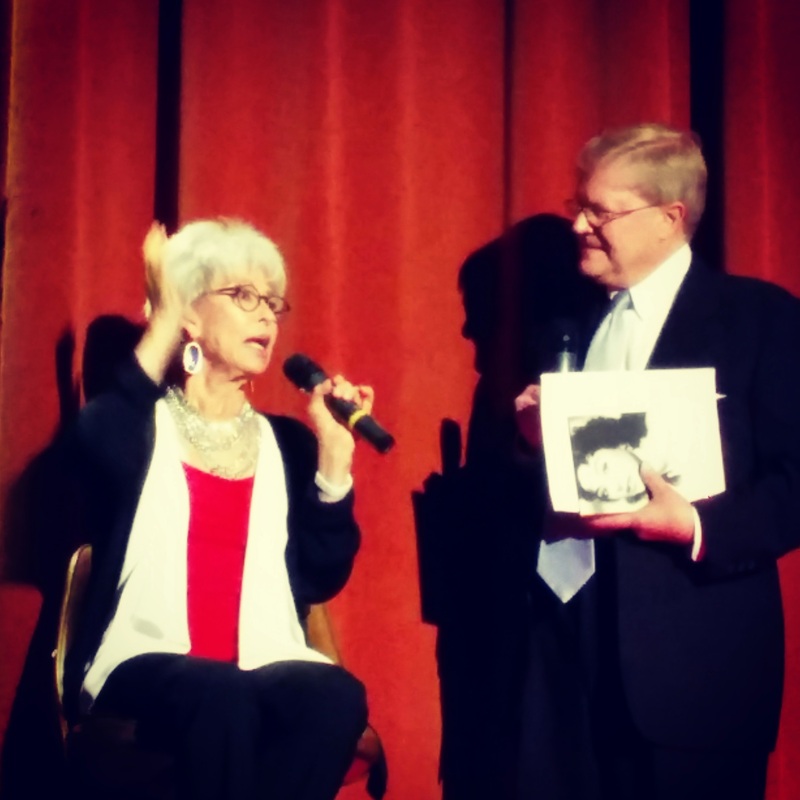 But Rita Moreno’s in-person presence and integrity stood out in the film viewing – the audience erupted into applause on several occasions when she appeared onscreen – and proved why she has been and continues to be an enduring legend in the entertainment world. Kudos to the Redford Theatre for another memorable tribute evening. I’m greatly looking forward to seeing who they next line up to visit their movie palace. Posted on September 30, 2014, in Movies, Theatre and tagged classic film, detroit, film appreciation, jerome robbins, leonard bernstein, musicals, natalie wood, oscar winners, redford theatre, rita moreno, stephen sondheim, west side story. Bookmark the permalink. 2 Comments. more fun coming on Thursday!